Kaftan dresses are made with comfort in mind. Batik kaftan is especially gorgeous as each one is handrawn making it even though might look similar, but each is a masterpiece of its own. For batik kaftan print - the process is by printing by wax manually the batik design onto white clothes, before it is dyed and then washed. 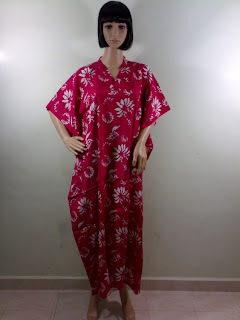 Loose kaftan dress is very comfortable with its roomy and airiness attributes ensures that it's a must be it for longing at home, evening gown, party dress or leisure parties. Laundry: For the first few washes, please wash seperately using cold water. Afterwards, gentle machine wash is ok but to maintain it's beauty, hand wash is preferable. To preserve the colour, hang under shades. * As of all batik product, slight smearing of colour might occur. CLICK HERE TO SHOP NOW AT OUR ONLINE STORE!